Yay, nothing like a solid poop to brighten one’s day! The brisket was probably delicious...and too rich! I had him skip a meal, then he ate steamed white rice and boiled chicken breast for 2-3 days and got slowly back on kibble. I will try the pumpkin next time, seems easier! Ya, we took her out every 2-3 hours during the night too! Definitely try the pumpkin! I've still been adding a couple tablespoons in both meals today. Perfect form from honest kitchen is good also soothes the digestive system. Last week our chihuahua was given to many dog treats and I think that’s what upset his tummy. It was the first time I had seen him with a upset tummy. I hope Mei is feeling better soon! When I was cleaning up after Topper’s accident because of his sick belly. 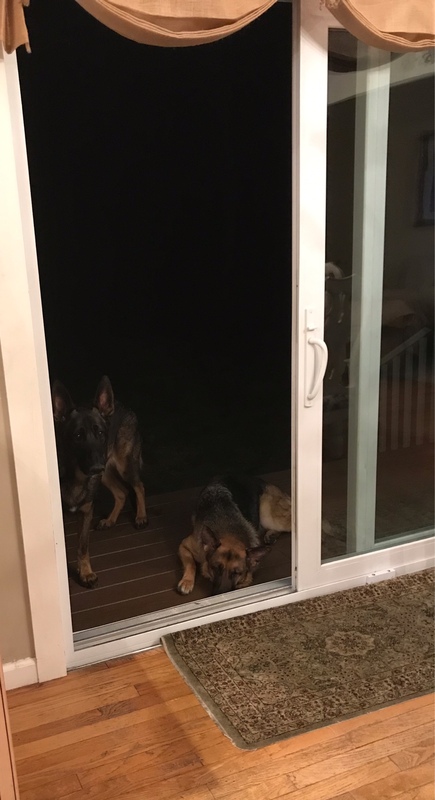 Max and Luna did not want to not come back in the house because of the smell. I was not upset either - Luna came in and started gagging and ran back outside. Which I thought was quite dramatic. Until the house was completely aired is when they came back in. I had to take a photo of them. They did make me laugh. Max looked very disturbed by the whole thing. Their strong reaction made me think that Topper contacted some awful virus but he was better the next day. It also made me thought of dogs in dirty conditions and made me quite sad- they are such clean animals. He did have some dog biscuits that day and just one to many that day. Last edited by Jenny720; 03-19-2019 at 08:51 AM. I know he probably was happy he had that effect on them lol! I hope Mei is feeling better! Ya, she's all better thanks!